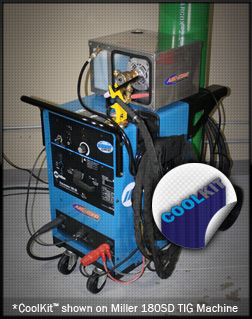 CoolKit™ Water-Cooled TIG Torch Upgrade Kit -- Everything in One Easy-to-Install Kit! Now It's easy for you to convert your entry level air-cooled TIG machine to the benefits of a High Output, Cool-Running Water-Cooled TIG Torch! You know you're tired of setting down your overheated air-cooled TIG torch just when you're in the welding groove. A water-cooled TIG torch is smaller, more efficient, delivers more amperage and lets you weld longer at much higher amperages. Say goodbye to your bulky, air-cooled TIG torch and say hello to the high-performance, cool running genuine Arc-Zone Pro™ TIG Torch Package included in your new kit. Everything you need, all in one package. Upgrade kits are designed for your air-cooled TIG machine including Miller® Econo TIG, Syncrowave® 180SD, 200, Dynasty® 200, 300, Maxstar® 200, 300. Lincoln® Square Wave 175, 175 Pro, 275, Precision TIG 185, 225, Invertec® V250ST. Plus other popular power supplies with International Dinse type plug connectors, or 1/2" (13mm) threaded stud connections. 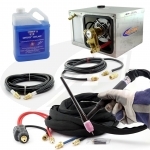 Premium Arc-Zone Pro Series™ 250 or 300 amp high-performance TIG torch package. Torch kits are powerfull, compact and cool running. Built with superflex rubber cables, protective cable cover and 3/32" (2.4mm) gas lens parts installed. High-efficiency 2 gallon (10,000 BTU) stainless steel closed loop water cooling system; 1 gallon of concentrated coolant, water-in/water-out hoses, fittings and adapters. Everything you need in one easy to order kit! Add a Pro Parts Kit: Everything you need to TIG Weld Like a Pro. Kit includes a complete range of front end torch accessories from .040" (1.0mm) -to- 1/8" (3.2mm, short medium and long back caps, TIG caluculator, spare insulators, or-rings, ArcTime™ brand hybrid high-performance tungsten electrodes and handy replacement parts list. Take Advantage of our Payment Plan: 3 Easy Monthly Payments Billed to Your Credit Card. . . Upgrade Today! Call Customer Care to Place Your Order at 1-760-931-1500. Note: Orders placed on Arc-Zone.com are not eligible for the payment plan. Certain restrictions & qualifications apply.